McQuearyClan: My Ears Are Meltin' With the Oldies. Alright, so Anna said that we may be able to finish our family game of Monopoly tonight. Logan got the Sponge Bob Squarepants version for Christmas. Anyway, we started a game Sunday afternoon that of course lasted in to evening. We recorded all of the properties and money, places on the board etc. Reagan and I worked as a team, Jenna was doing pretty good, Devin is about out of money while Anna and Logan are doing the best. So, we finished dinner this evening and I thought we were going to continue our game. 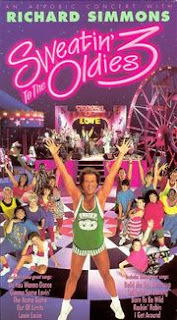 Instead, I am now listening to Richard Simmons, Sweatin' to the Oldies while Anna is....sweatin' to the oldies? Logan, while reading this as I type said I should take a picture of mom. I don't think that is a very good idea as I don't want to bein the proverbial dog house. I am going to be in enough trouble when she finds out I posted this. Hey Jon and Anna , Pat gave me you Blog address this is great.